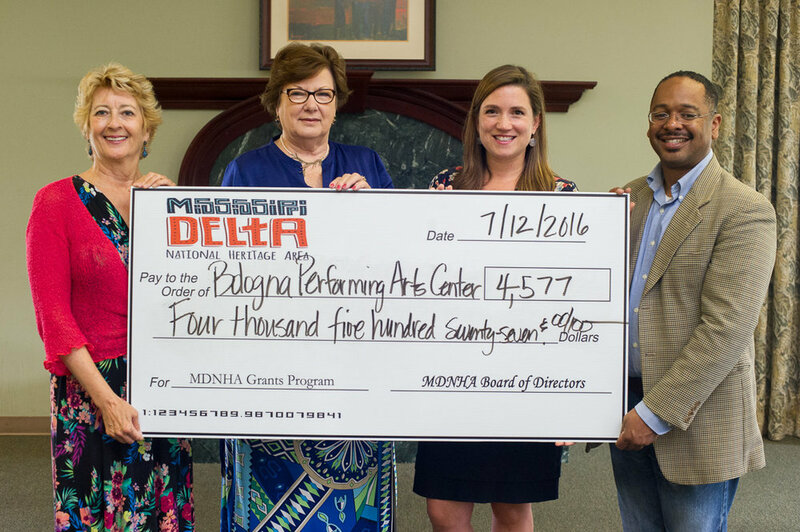 Read more about the Bologna Performing Arts Center at Delta State University here. (L-R) MDNHA grant committee chair Kim Terrell and board chair Dr. Myrtis Tabb present the grant to BPAC director Laura Howell, with MDNHA executive director Dr. Rolando Herts. Mike Wiley performing his one-actor drama. BPAC presented the Mike Wiley production “Dar He: The Story of Emmett Till” for a free community performance and post-performance discussion. In 1955, a 14-year-old black Chicago youth traveled to the Mississippi Delta with country kinfolk and southern cooking on his mind. He walked off the train and into a world he could never understand– a world of thick color lines, of hard-held class systems and unspeakable taboos. Young Emmett crossed that line and stepped into his gruesome fate by whistling at a white woman. The riveting plan chronicles the murder, trial, and unbelievable confession of the men accused of Till’s lynching. The one-actor, multiple-character original drama is performed by Mike Wiley, a North Carolina-based actor & playwright whose compelling works of documentary theatre yield rich and powerful journeys to milestones and turning points of a cultural history. The performance is co-presented by the BPAC and Delta State University’s Winning the Race Conference, and was funded in part by a grant from the Mississippi Delta National Heritage Area. This riveting play chronicles the murder, trial and unbelievable confession of the men accused of Till’s lynching. The original drama was 90 minutes long, with a post performance discussion with Wiley. The event was free and open to the public, and all advanced tickets sold out. The Bologna Performing Arts Center at Delta State University brings together artists and audiences to celebrate the arts, to enrich the cultural life of the Delta community, to educate and deepen the appreciation of the arts, and to explore the richness of our world heritage through artistic expression. Keep up with BPAC at their Facebook page.